Pat Flynn made 89,903.53 last month. This is down from the 89,000 he made in April. This doesn't happen by chance. Pat has always been a hard worker. If you haven't check out his book Let Go, then you should. You read how he did all the things you were supposed to do (go to college, work insane hours to get up the corporate ladder) only to be let go. Pat had been studying for a certification and was using the web to store his notes. Later when he passed the exam he uncovered that his notes were very, VERY popular. So he took the notes and repackaged them as an ebook, and put it up for sale. He never considered himself an author, but why not. It made (and continues to make ) a LOT of cash. Along the way Pat shares the good the bad and the ugly of his journey. 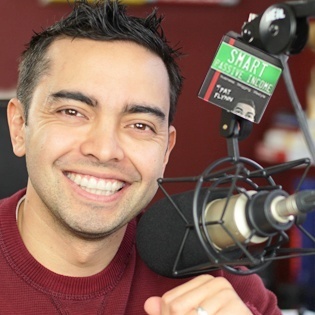 Today he shares some insights into what it takes to create content that truly resonates with your audience, and how he is taking podcast players to a new level with his Smart Podcast Player. Special thanks to Steve Stewart from Money Plan SOS for kicking off the show. Pat spends HOURS writing a single blog post. When you read his posts at smartpassiveincome.com you will see the insane amounts of detail that he puts into his posts. The goal is always to inform his audience in an unbiased way. The goal is to help his audience make an informed decision. By not selling out to the top bidder, and only talking about products he has first hand knowledge of, Pat is not only a resource, but a trusted resource. An example is the post we speak about on his email marketing checklist. It took him five to six hours to produce that one blog post. You will see in the post he not only tells you what to do (and why you should be doing it) but HOW. We see in this post that Pat writes a blog post with enough details to pass a test on it. Pat knows when he is most productive (he's a night owl) and that's when he does his work. He has a dedicated office. He admits that its hard to separate work and family, but in the same way that a employee clocks out to go home Pat knows that when he leaves his office he has “clocked out” and it's time for his family. When I read the book Let Go you get to see bonus videos of Pat with his family. It's very cool, and his passion and love for his kids is beyond evident. When Pat launched the Ask Pat podcast (a quick daily show where he answers one listener question) . He had a custom player created. You can find it at www.smartpodcastplayer.com or at www.askpat.com it has built in share buttons and if you have a large catalog (like a daily show will produce) it makes it easy to browse through the episodes and listen to the one you want. How Does it Work? It doesn't matter what media host you use. You input the location of your RSS feed and it pulls the information from that and creates the payer. This way when you release a new episode it automatically is added to the player. If you use soundcoud as your media host (for the record I would only use soundcloud as a secondary host – see my thought on this) you can add additional tags which may help you be found, and help people discover your content. Pat rolled it out the Smart Podcast Player to a limited beta group knowing there would be growing pains. Pat knew there were features he would want to add, and by rolling it out to a select few, he had a built in focus group to help him identify and prioritize new features that will be added to the player. When it first rolled out there were limited choices to the colors you could use. Now you can use any color for your player. As expected there were a few bugs when it rolled out. I worked with his group and they were very responsive and a great group of guys. With my recent moving of my website to a new host, I have had other priorities and have not activated the player on the new host (not that it takes a lot to put it into place – you know podcast movement, etc, first things first). 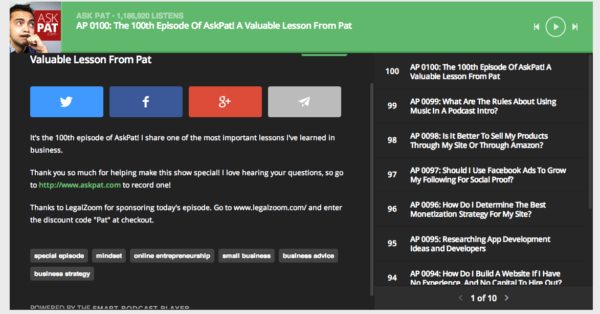 The Smart Podcast Player allows you to put a full page of your podcasts in one spot ( see screenshot) or you can put a single episode on your site. It will be exciting to see what features are added in the future. Pat talked about wanting the player to prompt you to join a mailing list (or other call to action). He realizes that while you could throw in a bunch of features, its best to roll them out slowly and make sure you are adding features that are wanted. Thinking of Starting a Podcast? The School of Podcasting has step by step tutorials to help you launch a successful podcast and get you into iTunes. 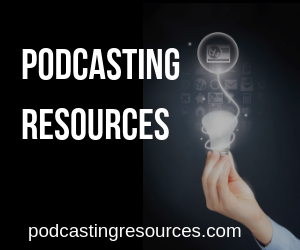 There are resources to help you get music and artwork for your podcast that will save you large amounts of money, and you also have your personal podcast coach Dave Jackson to help you along the way via email. Join Today.